Governor Chavit Singson of Ilocus Sur, a presidential friend and known protector of illegal numbers game called jueteng, accuses the president of the republic of the Philippines, Joseph Estrada, as the "lord of all jueteng lords" for receiving 5 million pesos protection money from jueteng every month during his term of presidency. He also accuses the president of receiving kickbacks from 170 million pesos excise tobacco tax. Clamor for Erap's resignation starts. Political and economic crisis worsens. During the impeachment trial, a bank executive testifies that Estrada has a hidden bank account in the Equitable-PCI Bank containing 500 million pesos (an amount not stated in Estrada's Statement of Assets and Liabilities) using a different name, which is "Jose Velarde." The defense objects to the testimony on the grounds of irrelevancy and immateriality because the said allegation is not included in the Articles of Impeachment. The presiding officer overrules the objection, however, he insists that the testimony will be accepted as evidence only after the prosecution proves that the 500 million pesos contained in that bank account is indeed ill-gotten money. Two days after the trial resumed from a week-long Christmas break, former Finance Department Secretary and colleague of the president, Edgardo Espiritu, testifies that the accusations alleged in the Articles of Impeachment with regards to the president's betrayal of public trust, are undeniably true. A new set of evidence inside a BROWN ENVELOPE is voluntarily given by a bank for the impeachment trial. The new set of evidence is said to prove that the 500 million pesos on a hidden bank account is ill-gotten and belongs to Estrada. It is also said to prove that the president owns more hidden bank accounts, all under different names. The prosecutors are told that the amount contained in the various hidden bank accounts totals to 3.3 billion pesos. Unfortunately, majority of the senators/judges (11 out of 21) votes to bar the opening of the mysterious BROWN ENVELOPE on the grounds of immateriality (not being included in the Articles of Impeachment). Prosecutors interpret the decision as a suppression of truth and an early sign of an acquittal verdict for the president. They walk-out of the courtroom. Anti-Estrada spectators in the courtroom walk-out too. 11:00 PM Militant groups, the civil society, left-wing groups, and a large anti-Estrada crowd unites in protest against the decision of the 11 senator-judges to bar the evidence. They gather in the EDSA Shrine, located on the intersection of Ortigas Avenue and Epifanio de los Santos Advenue (EDSA) in Quezon City. Jaime Cardinal Sin, a prominent figure during the widely popular1986 EDSA People Power, once again, calls on Filipinos to proceed to EDSA and stay there until, using his own words, "good has conquered evil". EDSA People Power II is formally launched. Other key figures in the 1986 EDSA People Power join the growing crowd in EDSA, like former presidents Corazon Aquino and Fidel Ramos. The impeachment trial is adjourned because of the prosecutors' resignation. Date of the trial's resumption is left undecided. The number of people in EDSA triples. They form a "Human Chain" from EDSA Shrine in Ortigas Avenue to Ayala Avenue in Makati City. This is to show Estrada that hundreds of thousands of people are already demanding his resignation. More and more prominent personalities and even friends and former colleagues in the entertainment business of the president are already calling for him to step down from office. Talks about the military's and police's withdrawal of support to the president spread. News about withdrawals of support to the president of the military and police is confirmed as high ranking military and police officials join the crowd protesting in EDSA. The military's and police's withdrawals of their support are key factors in making a president incapable of performing his duties. More than half of the president's cabinet members and a number of top government officials withdraw their support too and join the rally in EDSA.. All of these withdrawals of support give a big boost to the anti-Estrada crowd gathered in EDSA. 5:00 PM Estrada, for the first time in the last four days, is on television. Estrada addresses the entire nation and insists that he will not resign and would like the impeachment trial to go on. He adds that he already instructed his lawyers to allow the opening of the mysterious BROWN ENVELOPE. He stresses-out that only a conviction verdict from the impeachment trial would force him out of office. However, the people, with absolutely no hesitations, rejects Estrada's proposal. Despite the president's resistance to resign, the Supreme Court makes a unanimous decision to file a resolution declaring the position of president vacant therefore allowing the constitutionally-mandated successor, the vice-president, Gloria Macapagal-Arroyo, to take over. At exactly 12:00 noon, Gloria Macapagal-Arroyo takes her oath of office in the presence of the countless people in EDSA and becomes the 14th president of the Republic of the Philippines. Afterwards, she gives a 14-minute inauguration speech. The joyfulness of the crowd is indescribable. 2:00 PM Ousted president Estrada sends a letter to the media stating his doubts on the constitutionality of Gloria Arroyo's proclamation as president. However, he also states in the said letter that he doesn't wish to be a negative factor in the 'healing process' of the country, so he already stepped down from office. 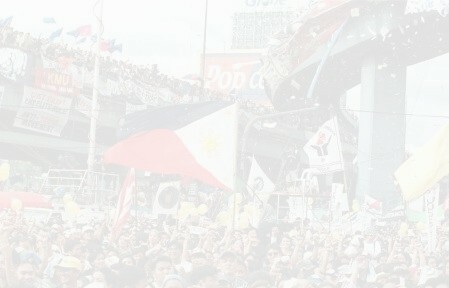 Once again, the Filipinos have shown to the entire world their sense of unity for peaceful & non-violent protests! The sipirt of EDSA lives on! Weeks after EDSA 2, Estrada insisted that he never really resigned and therefore is still the president of the republic. He added that Gloria Arroyo is merely an acting president. Estrada insisted on these in order to gain immunity from the plunder and other criminal charges filed against him. The law states that the president of the Philippines and other high ranking public officials have immunity from criminal charges filed against them until their term expires. However, the Justices of the Supreme Court, basing from the actions of the former president during his last hours in Malacanang, unanimously agreed that he undoubtedly resigned from office and because of this, he is no longer the president and no longer enjoys immunity from criminal charges filed against him. Estrada appealed the supreme court's decision, but the appeal was unanimously denied. During the last week of April 2001, Estrada was arrested for plunder charges. The supporters of Estrada protested the arrest by staging what they called "EDSA 3." It lasted for nearly four days. It was reported that most of these people were "paid" to go to EDSA by public officials who are close allies with the former president. They demanded Estrada's return to power even though there is absolutely no constitutional way he can return to office. Prominent allies of Estrada in politics persuaded the protestors to march towards Malacanang. However, they abandoned these rowdy rallyists afterwards. At early morning of May 1, pro-Estrada rallyists marched to Malacanang and attempted to enter the residential palace. Military men have already barricaded it, and using maximum tolerance, made the unruly pro-Estrada crowd retreat. The supporters of Estrada created a riot by throwing rocks, burning cars, destroying police stations, hurting policemen and even news reporters. They failed in their endeavor to bring Estrada back to power. They, along with other prominent Estrada allies who persuaded them to march to Malacanang were accused of �rebellion�. By the unquestionably rude and violent actions perpetrated by these Estrada supporters, this gathering cannot be truly called EDSA 3 because rallies in EDSA are always characterized by peaceful, non-violent protests.